Pete, 61, of Shepherds Mead, Findon Valley, will be running for Worthing charity Superstar Arts, in memory of member Martin Dickinson, and chose the Boston Marathon as it is the world’s oldest annual marathon. Superstar Arts provides creative activities for people with learning disabilities and Pete first met Martin a couple of years ago, after he and partner Pam Nye went along to one of their choir concerts at St Paul’s Worthing. 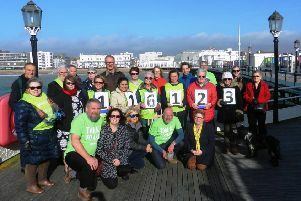 Pete thought it was a lovely charity to get involved with, so he then ran two marathons, last year’s Brighton Marathon and London Marathon, to raise money for the charity. Sadly, Martin died in October, two days after his 31st birthday, so Pete wanted to run another marathon in his memory. Pam said they were told Martin liked to watch the London Marathon from start to finish, so it was an appropriate tribute. Although Martin was not in the choir, he was a keen artist and helped to organise raffles for the charity. Martin’s parents asked Pete to donate half the money raised to a charity of his choice, so as well as Superstar Arts, he will be supporting Portsmouth Kidney Unit, which looked after Pam when she had a kidney transplant in 2015. Pete has been training since November, including on the South Downs to help him prepare for Heartbreak Hill, a well-known steep challenge in mile 20 on the Boston course. He has previously run in various parts of the world, including marathons in Barcelona, Nice, Berlin and Athens, inspired by the origins of the word marathon from 2,500 years ago. Pete has always loved running, having started at school. He said his favourite training run was along the seafront and through Kingston Gorse to Littlehampton. The marathon takes place on Monday, Patriots’ Day in America. Visit www.justgiving.com/crowdfunding/pam-nye to make a donation.